The Independent Music Network is set to change the music industry forever, so get ready for the ride! An artist or band will work hard and produce a great single or CD, then what? The major record labels could care less and radio can be a closed shop when it comes to getting new artists on the radio, especially if you are an independent. Many major market program directors can act as judge and jury when it comes to adding new music and there so many consultants in the mix that you can see why new acts never get a shot. It is our goal to help “level the playing field” by getting the best independent artists, bands and their product out to the entire music world. We are amassing a huge list of commercial radio stations to run shows for both “Mainstream” and Country. There will also be a satellite radio version of both formats in the coming months. With the Independent Music Network we will finally have a new voice in the music industry that is long overdue. “If I had something like this when I was producing and packaging music acts, I would have been all over it”, said Larry Weir who is now co-editor of New Music Weekly magazine and runs National Record Promotion. “It’s so hard to get the attention of radio on a large scale and this will be a new and powerful tool”, he added. Veteran recording artist and producer Billy Vera is also very excited about the new venture and he will be featured on radio and television with his “Music History Class” which will bring an insight of the music business of the younger generation. A version is on the way to radio stations in America and throughout the World. There are both Mainstream and Country versions set for release complete with music from the best independent artists in the universe along with interviews and celebrity guests. Remember when MTV & VH1 played videos? We are taking you back to that time period with a new slant and look. This time out you will get fresh and innovative videos from new directors 24/7 along with a new “Artists Snapshot” every hour. There will be music specials, “live” studio concerts, and even a music school we call “Music History Class” hosted by recording artist and radio historian, Billy Vera. 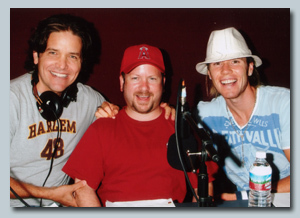 Michael Damian, Jason Rennebu (Warren G. Pickle) & Oli Trevina are featured together on the Independent Music Network’s “mainstream” weekly syndicated radio show. “Teen Witch”. Seen here (left to right) is the film composer Larry Weir, producer Alan Lambros, Peaches Christ (the host of the evening), Josh Miller (who starred in the film) along with a fan that flew from out of state to attend the “sold out” event. One of the many celebrity co-hosts featured on the Independent Music Network, Michael Damian hit #1 on the Billboard Charts with “Rock On”. Michael is known all over the world for his role on “The Young & The Restless” and he broke box office records while starring in the Broadway Production of Andrew Lloyd Webber’s, “Joseph & The Amazing Technicolor Dreamcoat”. Michael also went “independent” with his single “Shadows In the Night”. The video for the song is being featured on our Independent Music Network Video Channel set to premier in the coming months. Utilizing his years of experience as a performer with a # 1 MTV video, #1 Broadway box office hit and #1 series, Damian made the natural progression into producer and director with his feature film directorial debut, “Hot Tamale”, the award winning indie comedy starring Randy Spelling, Carmen Elektra & Jason Priestly. Damian's second feature film, Moondance Alexander, starring Don Johnson, Lori Loughlin and Kay Panabaker is set for a theatre release by Foxfaith this fall. Damian's next project will be directing the upcoming comedy/romance feature "Christmas at Castlebury Hall " principal photography will commence Feb. 2008 in Newport, Rhode Island. Damian also serves as co-writer and Producer. She’s our “roving music reporter” and you will find her at concert events and shows all over the world. The daughter of Jane Seymour, Flynn is also an accomplished actress as well. She joined her mother Jane in this year’s smash hit comedy “Wedding Crashers” with Owen Wilson and Vince Vonn. Billy and his band, The Beaters, had a #1 record with 'At This Moment' which was featured on Family Ties. Billy is one of the top voiceover men in the industry and is heard on everything from Burger King to Jiffy Lube. Over the years he has has produced records with everyone from Lew Rawles to the late and great Ray Charles. When it comes to "Music History Class" for the Country version of the Independent Music Networks weekly syndicated radio show, nobody knows more about it than Deston Rogers. He has worked for more than 20 years in radio broadcasting and has done everything from music director, program director, to morning show host. Deston is currently host of his own show on KCYN-FM in Moab Utah. He has also developed and hosts the "Independent Country Countdown" that uses the New Music Weekly Magazine Country chart as a base for his countdown show. Each week, Deston will bring you more "music history" along with some new facts and things about established Country artists you might not know. He is a Country star on the rise and it is only a matter of time before he's the "next big thing". Buck is an accomplished radio host, performer and producer that has been featured on the New Music Weekly radio show, the Jim Brickman show, Performing As (NBC), Knotts Berry Farm, and is set to star on the Independent Music Network's Video Channel as well. Visit him at www.buckmccoy.com. 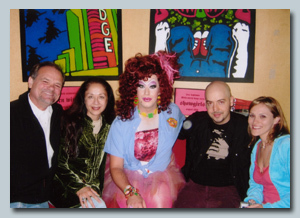 To our radio listeners he's known as Warren Pickle, the tough and rough music director/producer. Others know that this is one of the funniest and talented men in show biz today. He is set to star in a number of projects in film and television and will also be featured in the first reality based music show "Trashing The Music", right here on the Independent Music Network. Remember that you heard about Jason Rennebu first...right here!